Frozen apple slices work great in this recipe. Place apples and water in a 2 quart microwave safe dish. Cover apples with microwave-safe cover or plastic wrap and cook on high for 6 to 8 minutes or until apples are easily pierced with a fork. Use a potato masher or fork to make smooth or chunky applesauce. 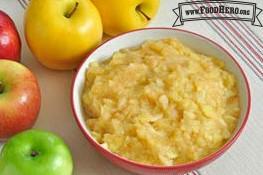 3 Comments for "Microwave Applesauce"
Homemade applesauce, nothing like it! This recipe worked great for me, did it for a pantry visit and everyone not only took the recipe, but the apples they were giving out to make it with! Works best with at least two different types of apples if possible. I made this recipe using fresh picked home grown Apple's, I'm not sure what breed it is. I'm wondering why it became so stringy. Did I not take enough of the core out or is there some apples that are not good for applesauce? The flavor was great and the texture was great except for the long stringy fibers. That is somewhat of a puzzle. The 'strings' must be part of the apple. Apples will generally all become soft with cooking so look closely at the core to see if that is the source.